It was not just housing for nationals that was examined by consultants working in Qatar in the nineteen-seventies. At the same time that the design of new housing designs for a local qabila were begun, a parallel exercise looked to see if a similar approach might be made with regard to expatriates, it being recognised that there would be a growing need to house them properly. The resulting designs were never critically examined nor, of course, considered for building. Nor were the designs published at the time. They are placed here in order that I have a record of them, warts and all. It is important to realise that this really was just a design exercise and had no formal recognition and that, with hindsight, the designs could have been considerably better. There was a concern that expatriate housing would, if found solely within the private sector, be expensive and incorporate poor standards in terms of their layout, space and finishes due to a number of factors, most concerning the novelty of this type of housing and the numbers that needed to be constructed. It was hoped that, by constructing a small area of housing for expatriate government employees, the project might seed private developments. Eventually this initiative went ahead for both Intermediate staff and Senior staff within the New District of Doha. the houses should suit expatriates both from the West and Arab countries. Implicit in these decisions was the idea that the houses would not be designed for the expatriate labour force that would be coming, nor for top management, both these types of housing being provided by the private sector; the houses were to fit the middle of the market and were unlikely to complete with the private sector. 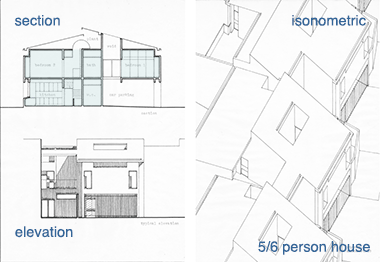 It was also a design parameter that the houses might be grouped around a similar cul-de-sac system as was provided in the al-Salata housing project, the external space within the cul-de-sac compensating for the lack of open space within the house lot and allowing the creation of a variety of play spaces for the families living around the culs-de-sac as well as parking space for visitors and service vehicles. These two notional diagrams illustrates the manner in which these units might replicate the al-Salata cul-de-sac layout. There is no attempt here to mix the unit types as would be required in practice, nor to show how other culs-de-sac might fit together with this group. It would be in a similar manner to those looked at elsewhere. Comment has been made below on the use of wind towers and scoops. Those shown here illustrate a concept and would not necessarily be integral elements of the design. although some attempt had been made to resolve the latter by the introduction of two-storey houses in the Rumaillah area that had open surrounding balconies similar, in a sense, to the main building of Sheikh Abdullah bin Jassim at feriq al-Salata, though with dissimilar detailing. One element that was not looked at in these designs, but which has become apparent in the intervening years, is catering for servants. In many parts of the Gulf there is an industry bringing maids, particularly, into the houses not just of nationals, but also some of the better off expatriates. In fact many of the houses constructed over the last twenty years have seen the incorporation of servants’ quarters, both male and female. There is no such provision in these designs though, were the exercise to be carried out again, it is likely that there would be such a consideration. shared bathroom for the two double bedrooms. There are a number of alternative decisions that might be made relating to relatively small elements of the design as illustrated, but that might have a significant impact on those who would live in the house. Again, these will be discussed later. The first illustration at the top of the page is an oblique aerial view of the first of these two renderings. These two images are more recent views of the five or six person courtyard house, produced to illustrate the design a little better. 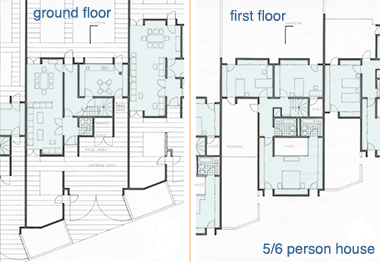 The chief difference between these three perspectives and the black and white original plan is in the connection of the garage to the house, this being a development of the plans for the three or four, and one or two person courtyard houses. I’m not sure why it was missed from the first plan, it should have been included as an important and integral element of the design. These two images illustrate slightly different arrangements in the relationship of the entrance door to the living spaces beyond. The original arrangement – the first of these sketches – was designed more for the use of Western families, so the living room, dining area and kitchen are loosely related. But the second of these attempts to make it more suited to Muslim families with the seating arranged peripherally. In order to effect this, the entrance was amended, removing the right-angled turn of the original. This causes the visitor to face the corridor, which is not the best arrangement. The second of the two sketches provides a better access from the garage to the kitchen, along the party wall, as the door to the kitchen has been relocated. However, this requires access to the kitchen from the family side of the house to be through the living/dining area, which is not a satisfactory solution. An alternative, additional, door from the corridor would resolve this, though diagonal access across the kitchen is not a good principle and cuts down storage and worktop space. In the first of the sketches the secondary access arrangement still exists but is probably redundant as those entering the house from outside with goods for the kitchen would most likely use the front door rather than the side access. These next two illustrations are small reproductions of the smaller type of the same courtyard house catering, respectively, for three or four persons, and one or two persons. The three or four person courtyard house is very similar to the larger five or six person house, particularly in the relationship of the kitchen with its associated open space. There is a different relationship between the main entrance and the kitchen, though none of this courtyard type design are able to have separate entrances for guests and for the kitchen as might be preferred. It is, however, possible with the second type of courtyard design. Having said that, it would be possible to provide access from the front of the house to the kitchen by creating an entrance across the top of the guest wash room, though at the cost of eliminating a window that provides light and ventilation to the dining room in the five or six person house, or to the kitchen in the three or four person house. In the smaller, one or two person house, there is a similar relationship between the entrance and its galley kitchen, but the kitchen in this case has no relationship with an external space, as illustrated here. This was not thought to be as necessary with the house being designed for one or two people although, with a variation to the kitchen layout, the kitchen and small courtyard could be readily connected. These two sketch plans are of the second type of single storey courtyard house that was produced as a product of the study. This type is mainly distinguished from the first scheme in that circulation is not a single central system as in the first scheme, but relies on two routes adjacent to the long party walls. The scheme has the advantage of separating the bedrooms and related access between parents and children, but has the disadvantage of having only a single courtyard to be shared by all three bedrooms. It is also possible that the living area is more difficult to lay out than in the first scheme. This is the three of four person version of the above scheme and provides two equally sized bedrooms each with an en-suite bathroom, and an enlarged private courtyard. 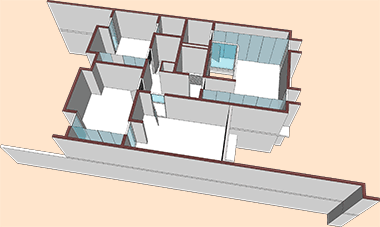 The living and dining area is smaller than in the five or six person house, but there is no good reason why this should not be enlarged particularly as, looked at in retrospect, the layout of the living area can be seen to be compromised. For reasons which are obvious on examination of the above two schemes, there is no one or two person version of this house. As was stated at the beginning of this note, these two schemes were notional and produced a long time ago. Nevertheless, there are a number of points to make that might explain them better. The most difficult part of this exercise was attempting to produce a design or designs that would suit both Arabs and Westerners, the two identifiable groups likely to inhabit the housing. It was assumed that the Westerners were most likely to be British, and the Arabs to come from northern Arab states. While there were seen to be widely different requirements, discussions with an Arab architect suggested that the two were not incompatible, and that it was in details that there were likely to be problems. Consideration of both these problems was thought to bring benefit to both Western or Arab families and their use of the houses. meals tend to be larger in volume. It was mentioned above that there was no provision for servants within these houses. However, with or without them there are still likely to be more than a single person preparing meals in the kitchen. The consequence of this suggests that there should be ample room to move around for at least two people. This issue is made more complex by the fact that kitchen pots and pans tend to be larger than used in the West, and this has an effect on the equipment located in kitchens. Firstly, the hobs need to be located further apart than they are on traditional Western stoves and, secondly, washing facilities need to be carefully thought through. Arab families are often unable to wash large pans in their kitchens which means they tend to do it either in the nearest bathroom or outside. A third issue is that cooking was inevitably by gas which usually means that gas cylinders were located outside the kitchen and connected into a building by a flexible hose. Associated with the planning and layout problems presented by use of the kitchen, Arab families tend to have larger food storage requirements as much is bought in bulk. Not only this but cold drinks are a constant requirement, particularly by children in the family. the noise and smells likely to be originating in the kitchen. The latter was seen as likely to be a consideration in all families, but the former requires some understanding of the way in which meals are conducted with Arab families. The need to wash is associated both with eating as well as with prayers in the Muslim world. As such, a guest washing facility is an important element of the house. A guest washroom was provided which included a water closet as well as a wash hand basin. What is really required is a separate space for the water closet and a space where a number of wash hand basins – at least two – would be installed. These areas can be extremely wet when in use and have to be finished accordingly. Having two doors between the living dining areas and the kitchen would diminish the problems of noise and smells from the kitchen, and this would be possible in both of the larger houses, though by different means. However, another design issue, that of ventilation made the reduction of noise and smells more problematic. The issue of privacy was also a concern if Arab families were to use the houses. While many Arab families might have no problem with male guests meeting their wives, there are likely to be occasions when they might not wish this to happen. In this case there needs to be a way of families moving between the private side of the house – essentially the bedrooms – and the kitchen. This was resolved in the five or six person house, but not in the three or four person house. In traditional Arab families where privacy is a requirement, it is resolved by the man or men of the house moving food between the kitchen and dining room. It should also be noted that a decision was taken to create a living and dining area as a single space. Although larger Qatari houses would have these as different spaces, traditionally spaces took on the functions given them, functions that would alter over the day with a room being, for instance by turns a majlis, ghurfat al-sufra and a ghurfat al-nome. The larger space has the advantage of being adaptable to a larger majlis if and when required, but there is also the possibility of closing it off and forming a separate room, whether for a ghurfat al-sufra or, perhaps, a maktab for the man of the family or, perhaps children needing a place to study. This arrangement is obvious in the five or six person house but would also work in the three or four person house, particularly if the sitting and dining areas are reversed. The issue of protection to the roof was taken seriously at the time of the design work as heat build-up in the roof structure, particularly in summer, was discovered to be intense. Insulation materials were not available at the time, so the solution was to suggest a light covering such as canvas to be situated just above the roof and allowing air to wash out the intervening space. One problem was realised to be the need for access to clean sand and any other objects on a regular basis, as well as having access to roof mounted water tanks that are not shown on these two sketches. It might seem more sensible to have the cover at least two metres from the roof surface to allow movement across it, but bearing in mind that these are contiguous houses, access was discouraged for social reasons. A second important consideration is that the farther away from the roof the shade element was situated, the more difficult it is to protect against solar gain from the oblique positioning of the sun, particularly in the afternoons when the ambient air temperature is high. While much of courtyard houses are protected by contiguous houses, the windows are potentially at risk from direct solar gain, depending on the orientation of the buildings and the use of wind towers. It was anticipated that external louvres would be the best solution for windows where privacy might be an issue. This would include the front window to the house giving onto the living area and, probably, the window between the living area and the courtyard behind it that is shared with a bedroom. For other windows a horizontal shading device would be suitable where needed. In the lower of these two illustrations the louvres are oriented to maximise light reflecting into the room from the tops of the louvres rather than being set to deflect rain. If they are movable louvres then they can be set as required. There is no reason, of course, why the louvres should not be set vertically rather than horizontally. Nowadays there are a range of different solutions to the problems posed by windows in the social and environmental conditions of the Gulf. open screens permitting the circulation of air within the building. Wind towers were considered for incorporation into the design of the courtyard houses but were not shown on the original drawings as it was not possible to agree either on a suitable size and location for them, whether there should be one located on every courtyard, what size they should be, what height they should be, or whether they should be in the form of a wind tower or wind scoop. The first sketch, above, illustrates a notional wind tower that would be fabricated from a translucent material such as canvas, hung off a steel or timber frame that would span the courtyard diagonally. Canvas was preferred as being readily available, and would not only act to bring air down, but also create shade from the sun as well as provide a secondary light source through the character of its material. There would also be a certain degree of movement from it. These two sketches illustrate something of the character and positioning of a schematic wind tower, the first view being taken from outside the courtyard house with the party wall removed, the second view through the window from the corridor running past the courtyard inside the house. The kitchen wall is on the left, the party wall lower right. It was considered likely that the type shown in the sketch above would be too short to be effective, though their width is probably larger than traditional wind towers. The possibility of having smaller, taller ones was considered, but it was thought their construction might be more problematic. This sketch illustrates one extending 5.50 metres above roof level, compared with the larger one, 2.00 metres tall, that covers the whole of a courtyard, and shows how it might be tucked into the corner of a courtyard, its base at 2.00 metres above ground level. But only tests would tell how effective it would be, and what its optimal height and width should be. Note in the sketches of the two different types of wind tower that, in the taller wind tower, the scoops at high level are channeled down the tower whereas, in the shorter wind tower, there was considered to be no need for this. There is one final note to make on the operation of wind towers, particularly if they are made of canvas. It will be necessary for them to shed water quickly when it rains as some rainstorms are extremely heavy. This led to the thinking that it might be possible to store water underground for the purpose of watering plants within the courtyard. Water needs to be led from the roof as well as from any tower structure. Any water that is not used within the house plot will need to be led to the front of the house, the other three sides of each unit being constructed against other units. Each courtyard would might be considered as a soakaway or have a storage facility integrated within it, but these options were not properly studied at that time. The sketch shows a notional rainwater downspout as a central element of the wind tower and which would direct collected water straight onto the courtyard. The issue of ventilation in traditional urban houses was usually resolved by the provision of open doorways or wall openings – sometimes with naqsh openwork panels incorporated into them – or with naqsh panels over doorways as shown in this photograph taken in an old house in Doha in the nineteen seventies. These are panels with fixed, open holes carved into them. The manner in which this was resolved in the expatriate schemes was by introducing louvred panels above all doors, as is demonstrated in these two illustrations. The louvres are shown as being glazed in order to improve the internal light levels. There are commercial systems that might be used which provide the ability to open and close the louvres, though it was realised that government would be more likely to use fixed louvres to keep costs down. But although both the traditional and new designs permit air to circulate through the building, they also allow smells and noise to percolate from space to space. While the louvres suggested in the door over-panels would be movable and capable of being closed, they would be unlikely to provide the resistance to noise that a masonry over-panel would provide. The furniture layouts shown in the sketches of the courtyard houses were based on the standard provisions made by government for their staff. In those days furniture was being constructed by the nascent furniture industry and relied on models and materials of mediocre standards. Flame retardant materials were unknown, for instance, and foams used in soft furnishings deteriorated rapidly in the heat. Glues also suffered in the heat and wooden furniture often came apart. The layouts shown in these old drawings are mostly based on the provision of loose furniture, but the industry also built in a lot of the requirements, particularly within the bedrooms and kitchens. Softwood frames and glued plastic sheet on blockboard were the norm. One great benefit of this was that there were more cupboards than might be expected in houses, though layouts appeared a little sparse, an effect psychologically reinforced by the hard surface of floor, ceiling and walls. 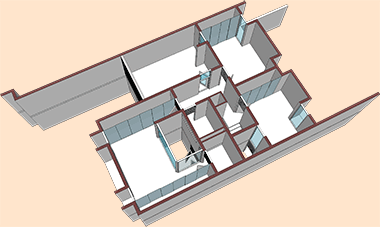 The aerial perspective illustrates the notional type and arrangement of furniture, though there is more cupboarding in the bedrooms than was normal, and the central feature of the kitchen is unusual. The drawings for this project were made a considerable time ago, but it seems sensible to give them an airing. The schemes above were all premised on the basis of housing being constructed at grade. In this they were loosely based on the government’s intent to produce housing for their nationals as single-storey buildings. Housing for Senior Staff nationals, however, were designed and constructed as two storey buildings. In the main this was a result of the larger requirements for rooms, but also reflected both social considerations as well as higher disposable incomes. Because of this, together with a perceived need to construct at higher densities for expatriate staff, it was decided to look at the possibility of providing two-storey accommodation suited to their requirements. The houses attempt to provide consideration for both Muslim and Western residents in their spatial relationships and response to environmental considerations. These two sketches illustrate row or terrace housing that might be suited to expatriate staff. They were one of a number of schemes produced to investigate possibilities suited to the environmental and social conditions obtaining in Doha, but were never seriously considered for construction. They are included here mainly as a record of some of the thought that went into the considerations for housing forty years ago. Some of the ideas in the scheme are interesting, but are also a number of difficulties to be seen when examined at this distance in time. The basic premise was that the houses would be spaced such that three would take up a single Senior Staff house plot of thirty-five metres square. These row houses are set at 11.6 metre centres, gardens being provided both at the front and rear of the properties. I no longer recall the reason, but these houses were placed at an angle rather than facing straight across the access road, perhaps for improved visual privacy. The pitched roof served to provide a degree of solar insulation and protection for the air-conditioning equipment and water tanks. Voids were created in the first floor to encourage air movement to benefit the inhabitants at those times of the year when cooling or heating was unnecessary, many nationals preferring ‘fresh’ rather than conditioned air, though not liking the dust brought by the shamal, much of which can be taken out by filtration prior to entering the air-conditioning system, but serving to clog its normal operation. These two aerial perspectives show something of the character of the building from two different angles. Window openings were set back and would be further protected by a variety of suitable shading devices to control solar heat gain and provide a degree of privacy. Wardrobes were used to give additional insulation to external walls. Bear in mind that these houses were considered to be constructed in the traditional 200mm concrete clockwork used at that time for all housing, and that there was considerable heat gain from walls, particularly those exposed directly to the sun. The provision of suitable storage has always been, and continues to be in most houses, a problem. The houses have considerable provision within the wardrobes, in addition there is space below the staircase that could either be accessed from the hall or the kitchen, or even from outside. But there is still likely to be a requirement for storage of items used for the out-of-doors life than many enjoy during the months suited to it. Some storage can be located in the area of the car parking below the main bedroom. To some extent the houses suit Muslim families though access for the family would be through the kitchen, which is not the best arrangement. Access between kitchen and dining area is no worse than in many designs but, if it was thought necessary, a wall or curtain could be provided between dining and living areas to allow for privacy when women are moving meals in or out of the dining area. Two alternatives are shown for the dining and living room areas. The front garden could be developed as an external majlis, if so desired. Otherwise, planting would benefit those sitting in the living room. A large and private terrace is provided at first floor level.